Welcome to the Second Overseas Highway shelf in the Overseas Highway Display Case. This page by Jerry Wilkinson The highway in the Upper Keys was badly damaged by the 1935 Hurricane. The hurricane also destroyed about 40 miles of the railroad which was not rebuild. 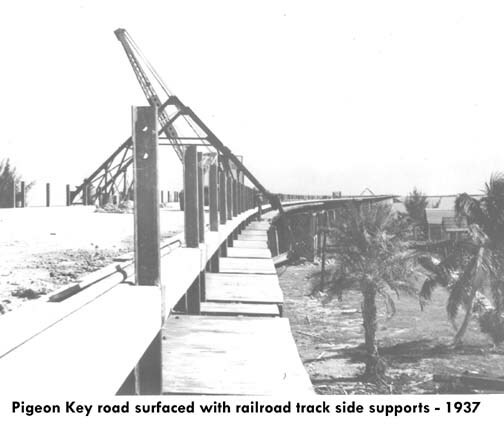 The entire Keys right-of-way was purchased to build a continuous highway replacing the ferry boats. The name "Second" is only used to distinguish between the 1928 and the 1938 highways. For a written history click HERE then "back." 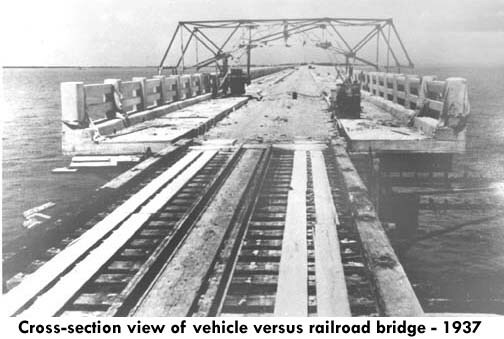 The railroad bridges were too narrow for two-lane vehicle traffic, therefore had to be widened for two lane traffic. Steel I-beams were used for the basic support structure, then steel re-enforcement bars and concrete poured as a road base. Another view of the widening process as seen from Pigeon Key. A side view after the re-enforced concrete had been poured. Note the sections of railroad track used to support additional sections of railroad track as rails. 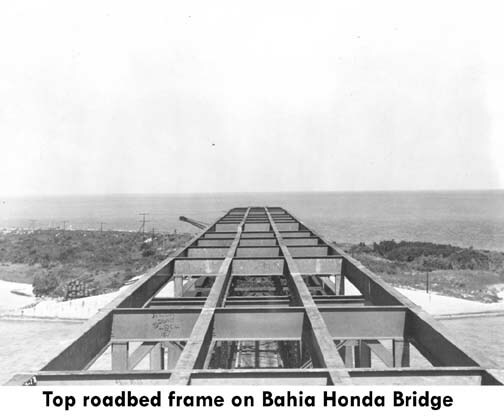 The Bahia Honda Bridge presented a special problem. It had to be widened at the top of the "camel-back" supports. Special ramp structures were built at each end and the camel-backs bridged across. This resulted in the view above. Steel I-beams were then laid across, formed and concrete poured as the other bridges were. This is the picture that tells a 1000 words. 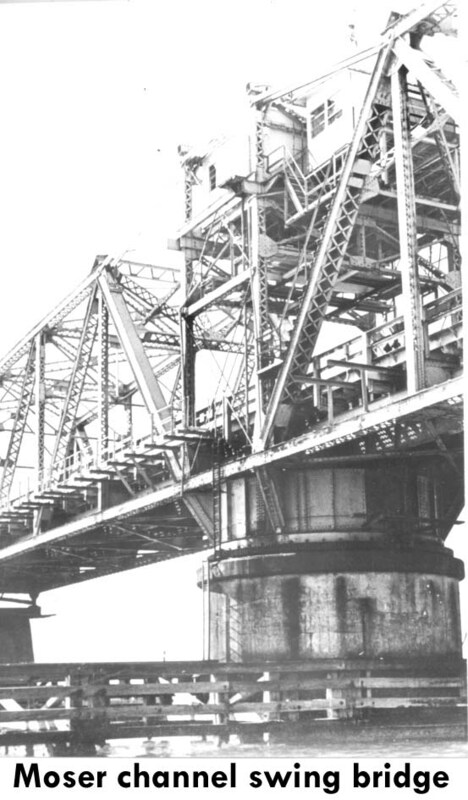 In the foreground is the narrow railroad bridge and from the center up is the widened concrete vehicle bridge. Each bridge was given 20 inch wide and 9 inch high curbs and a 20 foot driving surface. 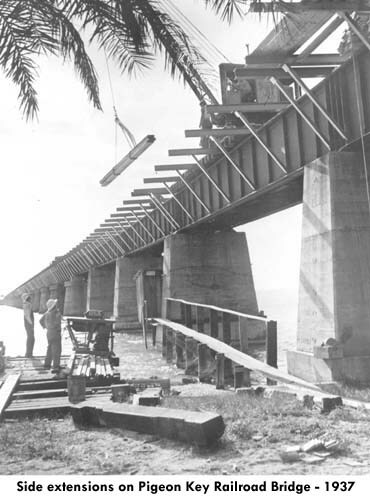 Vehicle draw bridges were added at Indian Key Fill, Channel 5 and Moser Channels. Note the bridge tenders cabin on top. 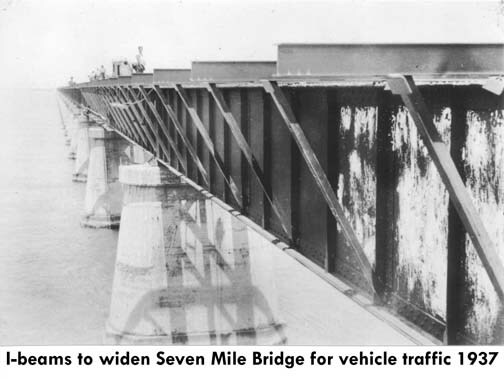 The highway was formally opened on July 2, 1938.